A high school student named Peter Parker is bitten by a genetically engineered spider, which gives him spider-like superpowers. He becomes a vigilante after his Uncle Ben is murdered trying to help apprehend an armed robber. Meanwhile, a scientist at Oscorp who has been experimenting with genetic engineering uses a serum that inadvertently turns him into a human-lizard hybrid. "The Amazing Spider-Man" is directed by Marc Webb...hahahahahahahahaha, his name is Webb and he directed a "Spider-Man" movie!!!! Prior to this, Webb had primarily directed music videos, as well as the dramedy about a failed relationship called "500 Days of Summer." Andrew Garfield plays the titular role of Spider-Man/Peter Parker as we explore this character's origin story one more time with a new cast and crew (because apparently, one time just wasn't enough). Parker, of course, is bitten by a genetically modified super-spider, which in turn gives him spider-like super powers. After Peter's Uncle Ben, now played by Martin Sheen, is shot, Parker becomes the vigilante named Spider-Man, cleaning up baddies all over the streets of New York. His love interest in this reboot is Gwen Stacy, played by Emma Stone, a fellow student at Parker's high school. Gwen is also a lab assistant at Oscorp, working under Dr. Curt Connors, played by Rhys Ifans, whose genetic meddling eventually turns him into the villainous antagonist known as the Lizard. Now, Spider-Man must save the city from this powerful supervillain's plan, though it won't be easy since police Gwen's father, Captain Stacy, played by Denis Leary, sees Spider-Man as an offender and lawbreaker every bit as bad as the Lizard. 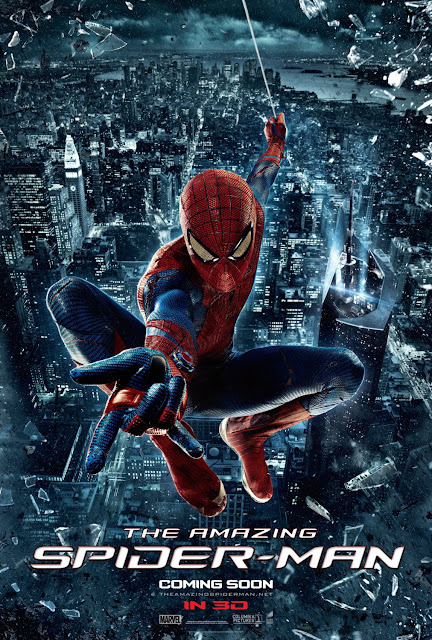 Just five years had passed between Sam Raimi's "Spider-Man 3" and this new flick. For a while, Sony was set to make part 4 with Raimi in tow, but he claims he could never get the script the way he wanted it and talks eventually fell through. Instead, Sony just decided to reboot the entire franchise with new blood in front of and behind the camera. This time around, they stuck Andrew Garfield in the titular role who, at the time, was a young and up and coming star, and we will admit, he does a good job as Spider-Man himself. Garfield is excellent at delivering the quick-witted, quippy attitude Spidey has always been known for. As Peter Parker, however, Garfield is too brooding, angsty, and is very dower. We also don't really buy him as a nerdy high school kid like we did Tobey Maguire. Garfield is a little too charismatic to be seen as shy, and his stride is a little too big to be seen as a mousy introvert. Emma Stone gives a decent performance as Gwen Stacy, and luckily, the two have excellent chemistry with one another. It probably helps the believability factor that Stone and Garfield were dating in real life at the time this movie got made. There are times when "The Amazing Spider-Man" truly shows what it has to offer in this bigger, more technologically savvy reboot. But, most of it is slow going, and the movie feels like it starts to drag early on. Even though it's not longer than any of the other three Spider-Man movies, it sure feels like it is. Don't get us wrong, there are some solid action sequences to gaze upon and as we mentioned, the advancements in technology over a mere five years really helps the overall look of the film, but the implementation of bad CGI is always looming around the next corner or cityscape. This is especially apparent on the Lizard, which looks really cheesy and clumsily integrated into the rest of the movie. There is just something about this reboot that doesn't quite do it for us, and we've even watched this a few times over the years to see if we feel the same way. We do. We never really feel a strong connection to the characters in this installment, which is hard to do with a group that should have the audience hook, line, and sinker. It does have an amazing cast, and most of them do a fine job in their respective roles, but unfortunately, it doesn't gel together like we wanted it to, and it's missing something magical that only Raimi has been able to capture thus far.